US Senator Elizabeth Warren has said she is focused on winning reelection in Massachusetts this year and not running for president in 2020 — but Democrats in the first-in-the-nation presidential primary state, New Hampshire, sure like the idea. 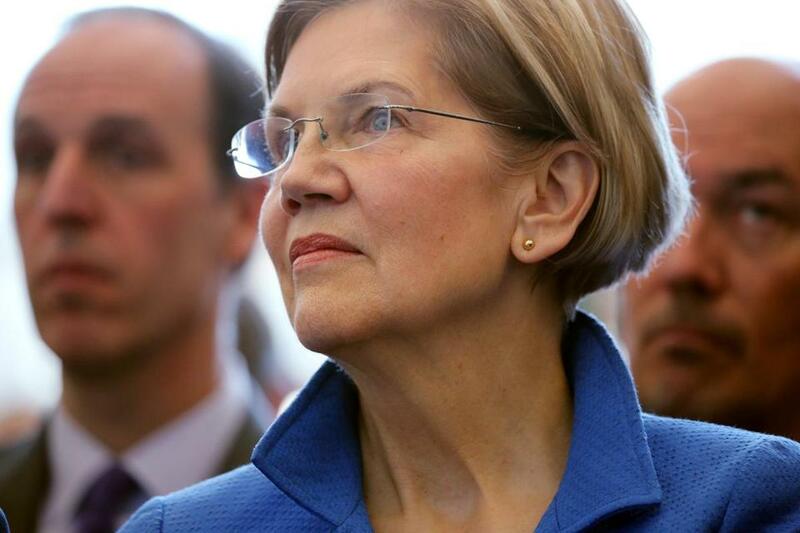 A poll released Wednesday by the Suffolk University Political Research Center shows Warren as the front-runner for the next New Hampshire Democratic presidential primary. When Warren is added to the pack of candidates, the Massachusetts Democrat leads former vice president Joe Biden, US Senator Bernie Sanders, and five other potential candidates. “The results show the potency Warren has by just showing up. Her presence on the ballot uniquely changes the game, to the point where whether she runs is one of the biggest question marks of the 2020 election,” Suffolk pollster David Paleologos said. The New Hampshire primary is still 21 months away, but campaign season begins in earnest in about six months — just after the midterm elections. Democrats say their next presidential primary field might have more than a dozen candidates. In the Suffolk poll that tested eight potential candidates, one in four of the most active Democratic primary voters in the Granite State said they would vote for Warren if the primary election were held today. Warren leads the field with nearly 26 percent, followed by Biden, who came in second with 20 percent, and Sanders, who had 13 percent. Democrats in New Hampshire seem to like the idea of Senator Elizabeth Warren in the presidential primary. The poll’s results were especially notable for Sanders, who, two years ago, defeated Hillary Clinton in the New Hampshire primary by 23 percentage points — setting up a protracted primary battle that went on for four months and through all 50 states. The poll questioned 295 likely Democratic primary voters on their choice for 2020 among two different fields — one with Warren, and one without her. Without Warren in the mix, Biden had nearly 30 percent and Sanders had 25 percent support among respondents — a statistical tie. US Senator Cory Booker of New Jersey had 10 percent support, and former Massachusetts governor Deval Patrick had 8 percent support. But with Warren in the race, Sanders’s support drops to 13 percent, while Biden receives 20 percent. In interviews with the Globe, poll respondents underscored the importance of electability in their choice. But Rachel Logan, a 49-year-old comptroller from Derry, said she picked Warren over Sanders because she viewed the Massachusetts Democrat as more palatable to the political middle. The Suffolk poll also questioned 315 likely Republican presidential primary voters on President Trump and other potential GOP candidates. Two-thirds of Republican voters in the survey say they want Trump to be the party’s nominee again in 2020. In a series of head-to-head matchups with other Republicans, Trump crushed his potential competition. The poll found the strongest primary contender would be former Massachusetts governor Mitt Romney, who is currently running for the US Senate in Utah. Romney, a 2012 New Hampshire primary winner, gets 28 percent support among Republicans against Trump, who got 63 percent. Romney’s score is at least 5 points higher than other potential challengers, including Ohio Governor John Kasich, US Senator Jeff Flake of Arizona, and US Senator Marco Rubio of Florida, when they faced the president in the hypothetical matchup. Frank Messana, a 63-year-old Nashua resident who participated in the survey, said Republicans considering a primary challenge to Trump will ultimately be unsuccessful. Yet, Trump remains somewhat unpopular among the 800 New Hampshire likely voters — Republicans, Democrats, and independents — polled April 26 to 30. Fifty-one percent disapprove of the job Trump is doing as president, while 42 percent say they have a favorable impression of the president. The poll of 800 likely general election voters had a margin of error of 3.5 percentage points and was conducted with live callers via cellphones and landlines.